How does the reading on your blood glucose meter relate to your risk for heart attack and stroke? I am on two different high blood pressure medications. Is that risky? What is the relationship between metformin and heart disease? If I splurge and eat more than usual, like on a holiday, will that have long term effects? I am thinking about asking my doctor about self-testing. Do I need to poke my finger? Where should I store my medications in case I need to evacuate in an emergency? I have a strong family history for diabetes. How often should I get screened? 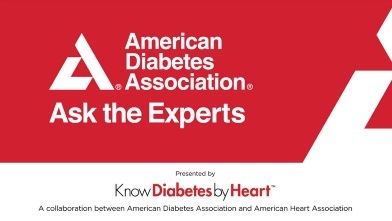 To address challenges commonly faced by people living with type 2 diabetes, American Diabetes Association created Ask the Experts Q&A, a free educational series focused on diabetes management and the relationship between diabetes, heart disease and stroke. Open to all, participants can ask their questions to diabetes experts in a live Q&A session online or on the phone. Events are currently scheduled monthly from November 14, 2018 through March 19, 2019. Register for free at diabetes.org/experts, call 1-800-DIABETES (800-342-2383), or text EXPERTS to 828282 to sign up for the series. Where to Start: Diabetes and Your Heart: Take the first important step to lower your risk for heart disease and learn the connection between type 2 diabetes and your heart health. This series is presented by Know Diabetes by Heart, a collaboration between American Diabetes Association® and American Heart Association®. Unauthorized use prohibited.